Prevention and repair of skin irritations. The skin, when exposed to extreme weather conditions, aggressive therapeutic, aggressive agents (ex: detergents, pool water, allergenic material jewellery, metals, plants, faeces/urine, etc), can develop rashes, severe irritations of the skin and cracks, needing a care that isolate these agents and that repairs at the same time. 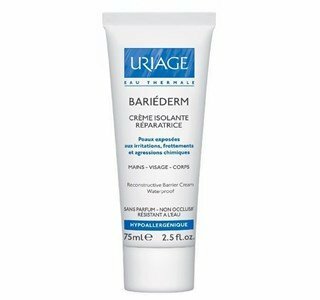 For these situations, Uriage created the Bariéderme line. Contains Poly-2p, an exclusive formula of Uriage Laboratories. It's an association of 2 polymers with double action on the skin: isolate the surface and repair in depth to restore the epidermis. Very used by healthcare professionals. With a non-greasy and invisible texture, Crème Bariéderme allows an easy and regular application. Apply whenever necessary on the area to isolate and repair. Can be applied on the hands, face and body.